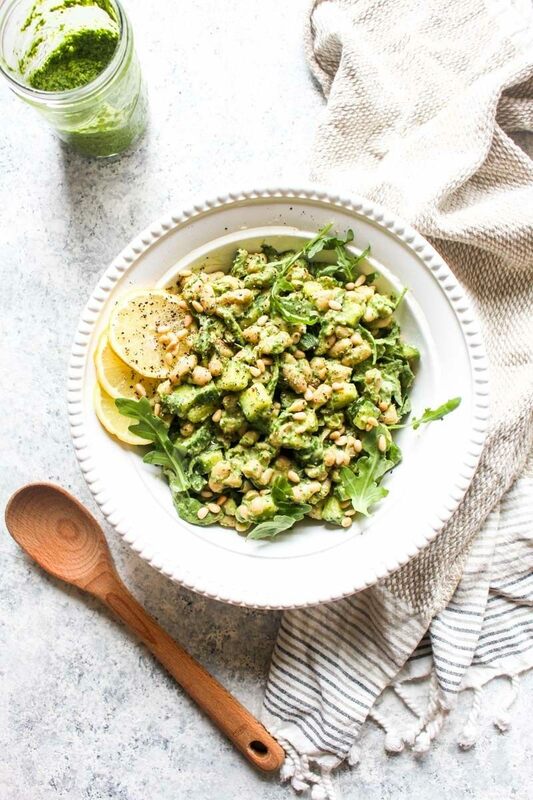 This healthy no-cook summer salad is bursting with bright basil pesto, crunchy cucumbers, creamy beans, and peppery arugula. Add all the pesto ingredients into a blender or food processor. Blend until it becomes a thick sauce, scraping down the sides as necessary. Reserve 1/3 cup plus 2 tablespoons for the salad and place the rest in a lidded container. Store in the refrigerator for up to one week. Add the cucumber to a large bowl and add in a pinch of salt. Toss the cucumber and let them sit for 5 minutes. Add in the remaining salad ingredients and toss to coat. Serve with extra pepper and lemon if desired.